Varicose veins are veins that have become twisted and enlarged. The most commonly affected veins are located in the legs and feet. Varicose veins are a sign of chronic venous disease. Varicose veins are a sign of chronic venous disease. Chronic venous disease affects the valves in your veins, whose primary function is to prevent blood from flowing backward. As a result, blood flows back into the veins, pooling in the lower leg. Venixxa can also help to relieve the signs and symptoms of mild-to-moderate chronic venous disease, including varicose veins. Ask your pharmacist about Venixxa. How To Get Rid Of Varicose Veins? There are measures you can take on your own to help prevent varicose veins from getting worse. Exercising, losing weight, not wearing tight clothes, avoiding long periods of standing / sitting, and elevating your legs can help to limit the progression of varicose veins. Wearing compression stockings can also help to improve circulation. On top of lifestyle changes, treatments like Venixxa can help to relieve the signs and symptoms of varicose veins. Venixxa can be used with compression stockings and can be found in your local pharmacy. Ask your pharmacist about Venixxa. Sclerotherapy: In this procedure, an injection is used to cause the unhealthy veins to scar and close. This results in the blood rerouting through healthier veins, reducing the appearance of Varicose veins. Laser Surgery: This procedure involves the use of a laser to send strong bursts of light into the vein, causing the vein to slowly fade and disappear. Varicose veins are a sign of chronic venous disease, a progressive disease that can get worse if left untreated. 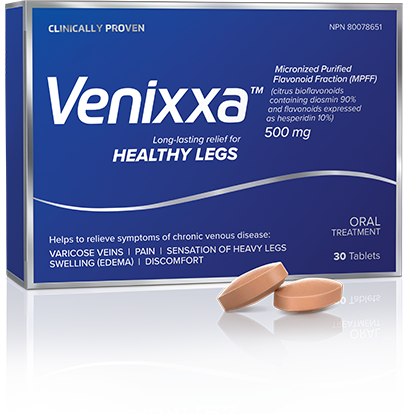 Venixxa can be used to relieve signs and symptoms of Varicose veins. Ask your pharmacist about Venixxa. Spider veins are a sign of chronic venous disease. Chronic venous disease affects the function of the valves in your veins, whose function is to prevent blood from flowing backward. As a result, blood flows back into the veins, pooling in the lower leg. Sclerotherapy: In this procedure, an injection is used to cause the unhealthy veins to scar and close. This results in the blood rerouting through healthier veins, reducing the appearance of spider veins. Laser & Infra-red: This procedure involves the use of a laser to send strong bursts of light into the vein, causing the vein to slowly fade and disappear. Spider veins are a sign of chronic venous disease, a progressive disease that can get worse if left untreated. Venixxa can be used to relieve signs and symptoms of spider veins. Ask your pharmacist about Venixxa. AVAILABLE AT YOUR LOCAL PHARMACY. ASK YOUR PHARMACIST ABOUT VENIXXA™. If you are not able to locate Venixxa™ in-store, please speak to the Pharmacist who will be able to assist you. If the store has no stock of Venixxa™, the Pharmacist may be able to order for you. Delivery usually takes 2 to 3 days. © 2019 Servier Canada Inc.
Venixxa is a trademark of Servier Canada Inc.